You really cannot talk about the Philadelphia Orchestra without talking mostly about Leopold Stokowski and Eugene Ormandy. Muti came along and tried to kill everything they had built. Sawallisch is doing a better job and the Philadelphia Sound is more present than before. Still, it is a pale reflection. When I started collecting classical music Ormandy and the Philadelphia were damn near synonyms. Of course, at one time the same was true of Stokowski and the Philadelphia Orchestra. So, it is good to see that much of the contents in this set are of their work. I'll be honest this is a mixed bag. Over half of the contents are wonderful and offer valuable insights. On the other hand, the Muti and Sawallisch discs are a bust. I never could stand what Muti did to the Philadelphia Orchestra and to have evidence to remind me doesn't help. I really wanted to like the Sawallisch disc. The Maestro sought to recapture some of the Stokowski Sound. I remember a chat with Rob LaPorta, who attended the recording sessions of Sawallisch's recordings of Stokowski transcriptions with the Philadelphia. Rob told me that they all played as if Stokowski were present. Given that bit of information, I particularly looked forward to listening to the Martinů. Alas, it disappoints. There goes the bad news. Volume One is one of the best of the set. It opens with their first recording, Brahms Hungarian Dance #5 from a 1917 acoustic recording. Now, I know it was included for historical purposes, and you can hear why Stokowski had reservations about the recording process when it was in its infancy. You can't really make out "The Stokowski Sound" here because of the limitations of the medium. On the other hand, this is one of the best acoustic recordings of the time. Stokowski knew how to maximize the acoustic process and liberally changed orchestration to that effect. Next comes the Beethoven 5th from a live 1931 performance. Yes, live! The notes give the details and I won't go into them deeply. At this time Stokowski was working with Bell Labs as they experimented with sound reproduction. Mikes were hung in the Academy and this performance was 'taped'. The surface noise may bother some more than others, but beneath it is one of the greatest performances of this piece I have ever heard. You can hear the Stokowski Sound: the deep, rich bass underpinning the orchestral play. The opening is more ominous, fate laden, than victorious, but that was not unusual for the time. The performance has a "white hot intensity" (from the notes) that rivals a similar broadcast Stokowski made with the NBC Symphony Orchestra. At times I wrote "WOW" for lack of a better description. I would argue that this performance is further evidence that the Philadelphia Orchestra was the best in the world in 1931. Then comes the Sibelius 2nd. I have not heard a performance of this piece that has moved me as much since I was first captivated by it in the late seventies by Colin Davis and the Boston Symphony. Everything is perfectly timed, every detail emerges just right. There is a mystery here that eludes most everyone else. I would argue that this is better even than Barbirolli's Royal Philharmonic account. (I read once that members of the orchestra literally cried on the return of their beloved Maestro. Stokowski had returned to his favorite instrument and they played together like lovers.) The amen at the close leaves me drenched. The sound, FM stereo, is very, very good. The next disc offers more Stokowski and a bit of Ormandy. Of course most of us are familiar with the Wagner from the Columbia LP. This is its first appearance on CD and the sound is superior to the LP, warmer and more detailed. Stokowski made several recordings of Tristan und Isolde excerpts, all of them sensuous, and this one is perhaps the best of the lot. The Tchaikovsky piece features Stokowski's usual soft close rather than what the composer wrote and frankly I think it does make more sense that way. Of the Ormandy items I was particularly impressed with Piston's Symphony #7. I have no comparisons and frankly find this performance just fine. Rachmanioff's "Isle of the Dead" is as soulful and dark as you would ever want. It is also good that they have included things like the Schoenberg. Ormandy got type cast as a conductor of the mainstream material later in his career. We forget that he also performed work of contemporaries like Schoenberg and Piston. Many of us grew up hearing about the "Philadelphia Sound" – a Cadillac of orchestras. Ormandy once opined, "I am the Philadelphia Sound". To be honest, Ormandy inherited the Stokowski Sound and didn't fix what wasn't broken. Later the orchestra homogenized a bit and that became the Philadelphia Sound. I sometimes wonder if Ormandy wasn't a bit jealous that the Stokowski Sound didn't later come to be called the Ormandy Sound. Whatever. As I said in the beginning, you cannot really think about the Philadelphia Orchestra without thinking of Stokowski and Ormandy. I have already dealt with Volumes 2 and 3. Volume Four is another gem. I can well imagine guest conductors looking forward to working with the Philadelphia Orchestra much like a violinist offered a Strad. The Mahler is a bit of a let-down but that could be due to the sound, which is a bit distant. I also have to confess that I cannot stand Toscanini. His English accent sounds like a German barking at the orchestra and they respond in kind. While the Reiner and Tennstedt are wonderful, the highlight of the set is Bruno Walter conducting Debussy. We tend to associate Walter with the German classics, and this Debussy is a revelation. Then just listen to the opening of Ravel's Daphnis and Chloé Suite #2 with Charles Munch conducting. It is like he is just relishing the sensual experience of being able to conduct such an instrument. This sense is what pervades most of the performances in this volume. When I was a kid my dad would occasionally listen to classical music. This is probably one reason why I am writing about it today. He had a monaural system at first; with a Radio Shack speaker he built himself. We also would occasionally get the local public radio station on. Whenever a soprano would begin to warble, my mom would say, "That woman's starting to hollar…" and my dad would turn it off. I think this attitude is not uncommon among lovers of classical music. There are some people who believe that the human voice is the worst instrument on earth. If you take the time to really sit back and listen to Volume Six, however, you will find a lot to learn and love here. To listen to Marian Anderson sing Brahms, accompanied by the greatest orchestra in the world at that time, there is an earthy, folksy feel to the singing that may not be inappropriate. I also learned that a soprano is not a soprano, etc. Beverly Sills has a voice much different from Joan Sutherland. Sutherland's voice is just slightly deeper, more resonant. I also learned that I do not like the soprano Nilsson. Her voice has a piercing sound to it that rubs me wrong. Of course I also was able to get an operational definition of the difference between a coloratura and a sopra#It goes on. I won't comment on the men as yet, I am still enjoying learning about the women. I am enjoying this disc a lot more than I thought I would. The Stokowski items are also available on a Belle Voce two-disc set that includes all of the vocal music Stokowski did on his return to Philadelphia. The sound here is a significant improvement over those discs. Then, too, many of you may not have access to that set, even if you wanted it. So it goes. Let me tell you, however, I would recommend this whole set just for Volume Seven. It houses the Sibelius Concerto for Violin with Stokowski and Heifetz. It is slower by two minutes than his recordings with Beecham and Hendl. On the other hand, the piece is played as a concerto, not as a violinist with symphonic continuo. The sound is Romantic, the orchestra the best of the lot. Heifetz seems to be more emotional than in the other recordings. Maybe he was just pissed at Stokowski and the anger translated somehow into a passion not often in Heifetz recordings. I am sorry, but I have always found Heifetz an ice man. The recording you are getting to hear here was never released until now because Heifetz refused permission. The notes tell the story so I won't. I have to admit, I feel like I am being allowed to glimpse a bit of history's secrets… it's neat. There are other treasures in this volume of the "Instrumentalists". Kapell's Brahms 1st, with Ormandy, is fascinating. Not long ago I reviewed the Kapell Edition from RCA and recall reading that the company didn't record Kapell in Brahms because they felt 'Brahms should be played by older pianists'. Imagine what that would do to today's crOp. Anyway, they were wrong. Also we are offered Beethoven's 4th Concerto for Piano with Ormandy and Hoffmann. I should mention that both the Brahms and Beethoven Concertos are interrupted with applause at the end of the first movement. This was not unusual at the time, but will come as a surprise to you at first. Nonetheless, you will also be tempted to jump up and applaud, too. I will confess that I am not enamored of Richter as much as some people. I find his playing too percussive for my tastes. You may not share that opinion and love this live performance. I will also confess that I didn't listen to the Tchaikovsky. It is probably a great performance. In 1980 I had a student I was very close to kill himself. I discovered that during the process he was playing a cassette I made for him of this piece of music. Enough said. The copious notes are interesting if not insightful. They mainly focus on the musicians, as should be. Not enough is said about the recording quality. For example, they might have discussed the reason for the amount of surface noise on the Beethoven 5th. Some people may find it bothersome, as I mentioned, and an explanation would have been helpful. They did, however, explain the tick in the first movement of the Sibelius Concerto for Violin. Frankly, my appreciation of the performance and recording was so great I barely noticed it. Anyway, the notes are good and enjoyable. So, time for a conclusion. I recommend this set with a few reservations. There are no reservations regarding the sound. Mark Obert-Thorn oversaw the project and Ward Marston did the transfers that were needed. Perhaps you like Muti more than I (you'd almost have to) and perhaps you will take to the Sawallisch than did I. Still, as I said, I'd recommend the set just for Stokowski and Ormandy. The guest conductors set is wonderful, the singers disc is a joy, the instrumentalists set is fascinating. The money, $200 plus $5 for shipping and handling, goes to a good cause. 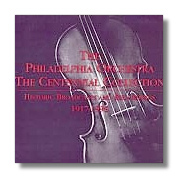 For information to order a set call: 1-800-457-8354 or visit the Philadelphia Orchestra web site.